Welcome to Optimizing Me! Come find ideas of new healthy habits to incorporate into your life to help become the best & happiest version of yourself! It must be getting cold out because I've got the dark chocolate munchies... I found some amazing dark chocolate almond bark with sea salt at Costco a while back & decided to make my own. It was ridiculously easy and dangerously delicious! 1. Heat chocolate on a double burner or in a microwave (stir every 30 seconds until chocolate is melted). 4. Spread the chocolate mixture out on the parchment paper so it is approximately 1/2 in thick. 7. 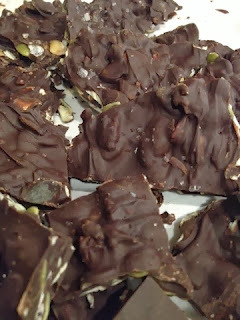 Break chocolate into smaller pieces & enjoy! Keep up the good work on drinking 64 ounces of water each day this week! What are your favorite "healthier" treats to make for the holidays? Never miss a post... follow by entering your best Email! Hi, I'm Bethany! I am a wife, mother, health foodie and I have a daily mission: Optimizing Me. I hope that's why you're here too. Whether it's working on your physical, mental, emotional, or spiritual improvement, I believe it's the positive daily habits we form that make a life worth living. I want to share some of the things I've learned and the new things I'm trying to become the optimal me. I hope you'll join me in this life-long journey and join the community for a lot of great ideas and fun! Buy Reusable Produce & Bulk Bags - Made with Love for the Planet! How we are Reducing Waste for Christmas!